Testimonials by WooThemes is a free plugin that helps you organize and display customer testimonials on your website. You can install it through your WordPress dashboard in Plugins > Add New. 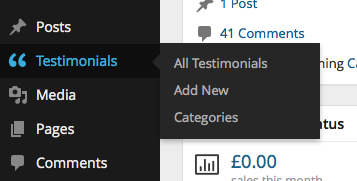 After installing and activating the plugin, you will see a new menu in your WordPress dashboard called Testimonials. Add a name in the title field. 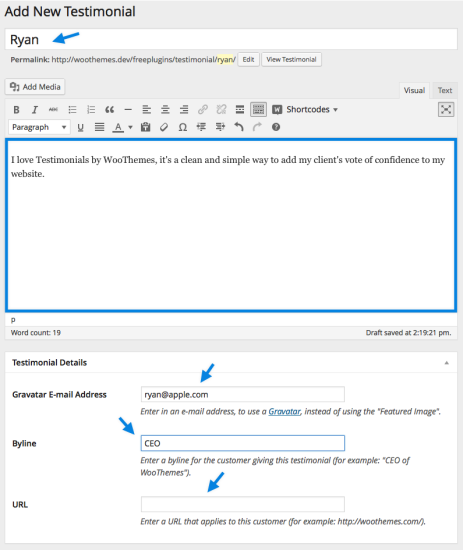 Add a testimonial in the text editor. 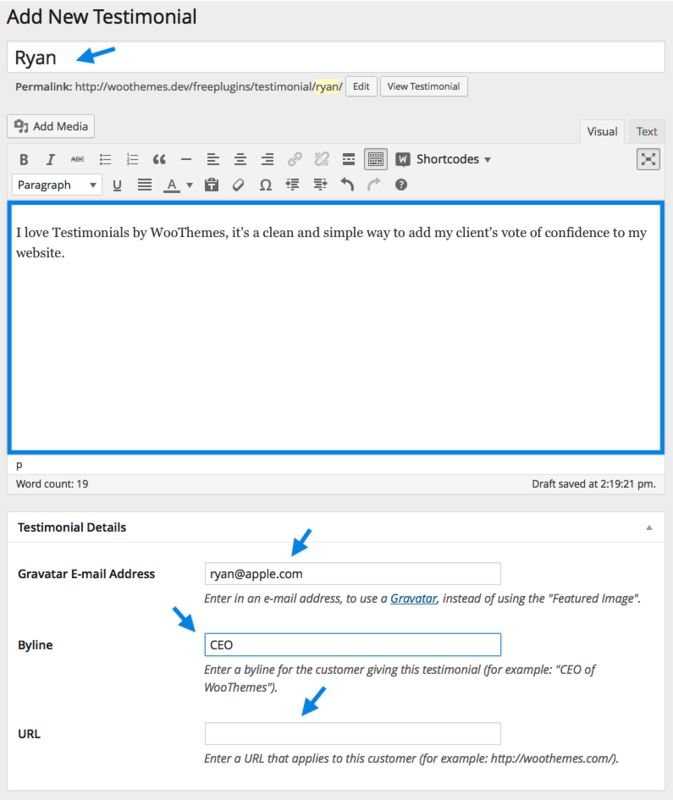 Add a Gravatar e-mail in the Testimonial Details panel. Setting a Featured Image will override the Gravatar image. Add a byline in the Testimonial Details panel. Add an URL in the Testimonial Details panel. Instead of Gravatar, you can add an image through the “Featured Image” panel. You have 3 options for displaying your Testimonials, you can insert them with a shortcode, widget, or add them via a php template file or custom plugin. To add your testimonials as a widget go to: Appearance > Widgets to find the Testimonials Widget. With this you can modify the following settings. You can find all of the available parameters listed below. You can simply include these in your shortcode as well. Note: You do not need to wrap the parameter for the shortcode in quotes. You should wrap the value in quotes however. Please use the example above as the guide. The testimonials ID can be found under Dashboard > Testimonials. From there, edit the testimonial you want to get the ID from. Once you do that, the URL will be http://yoursite.com/test/wp-admin/post.php?post=4&action=edit. In this case, 4 is the ID of the testimonial. Similarly, the category ID can be found under Dashboard > Testimonials > Category. From there, edit the category you want to get the ID from. In the URL, you’ll find something like &tag_ID=6 with in this case 6 being the ID number you need.